2421 is one of a batch of four catering vehicles (2419-22) constructed by CIÉ at Inchicore works in 1956. These followed an earlier batch of fourteen vehicles built in 1953. Originally these catering cars where used in AEC built diesel railcar sets, while also being able to run in conventional locomotive hauled trains. The 1956 batch featured the newly developed Commonwealth bogies. 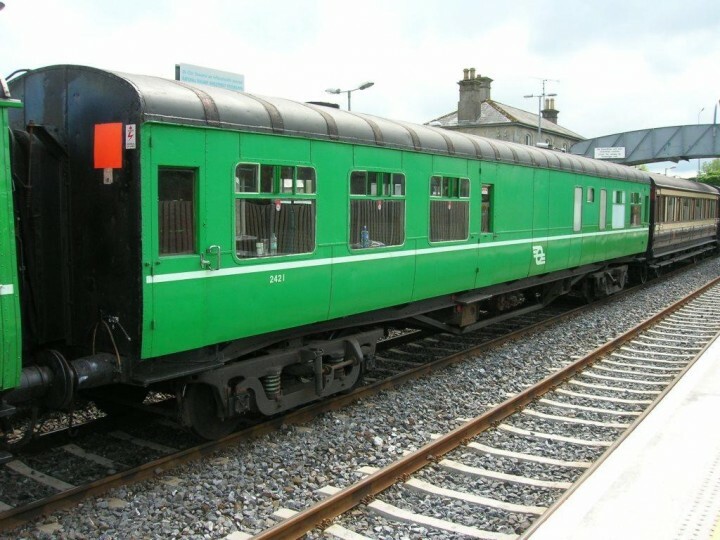 These were some of the last catering cars to be built by CIÉ in Inchicore; only two more were constructed after this batch, with anything after these being converted from existing rolling stock or bought in from foreign manufacturers. 2421 and her sisters would have seen use of most of CIÉ's main lines over the years that followed, including use on named express trains such as the "Sláinte" from Cork to Dublin, and the "Cú na Mara" service from Galway. They would also have been used on the Dublin based "Enterprise" service until displacement by Mk2d rolling stock. They would also have been a feature of special trains run for such varied events as the Mallow races, Knock pilgrimages, GAA matches and nights at the theatre! When Pope John Paul II visited Ireland in 1979 one of the 24xx series carriages was positioned in a bay platform at Pearse station and did a roaring trade serving refreshments to the vast amount of visitors to the capital that day. 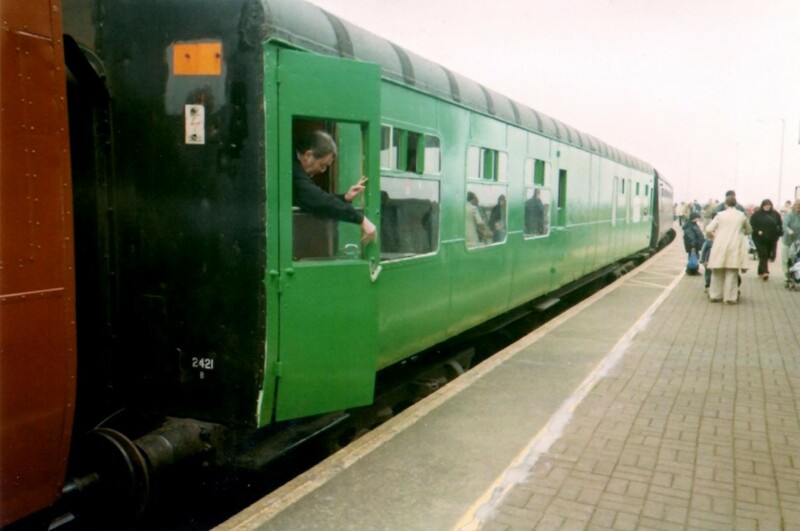 The arrival of the Mk3 type carriages from the mid 1980s on saw the gradual withdrawing of wooden-bodied 1950s stock including 2421 from service. The last two of the 1950s dining cars in service were 2414 and 2415, withdrawn in 1988. 2421 was fortunate to be preserved, entering RPSI service in 1995, making her debut on a "Greystones Shuttle" operation on 7th May 1995. Then based at Heuston sidings, our volunteers extended the bar area; she is now is one of the few railway vehicles in the world on which draught stout may be obtained. The Society also owns sister vehicle 2422, acquired in 1985 and currently stored at Whitehead. 2419 has been preserved by the Downpatrick & County Down Railway. Along with other members of the heritage set, this vehicle has been used for various film roles, including Michael Collins (1995) and Amongst Women (1997). In service it would have carried two basic liveries. 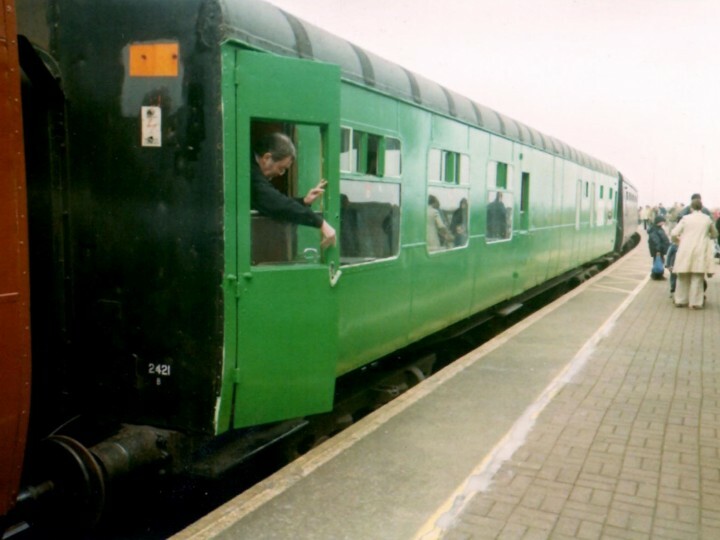 She originally it carried CIÉ green with the 'flying snail' logo until the mid 1960s, after which it was painted in the then new 'black and tan' livery. It currently carries the earlier green livery, although it has also appeared in brown for a period following film work. She operated as part of our Dublin based Heritage set until Autumn 2010. 2421 is currently stored out of service with the rest of the Heritage set at Inchicore, but could be made ready for service subject to volunteer resources and suitable covered accommodation.